← 3 Men and a Baby?? Whatever!! Try 1 Lady,1 Review and 1 Recipe! I hope everyone had a wonderful Memorial Day/ Weekend. I started the Holiday on Thursday by going out to lunch with a friend to an area known as “Little India” (http://littleindiasd.com/). It’s located off of Miramar Road on Black Mountain Road, and it’s close to I-15, so it’s easy to access. “Little India” consists of a few restaurants, some Indian stores, and a grocery store. Miramar Road is a little crazy. There are probably hundreds of stores on the street, and everyone is driving at least 50 miles per hour, so if you are looking for a particular shop or side street (like Black Mountain Road), it can be a little daunting. But if you are in the market for furniture, car window tinting, a growler from AleSmith or Rough Draft Brewing Company, or an Indian feast, look no further than this area. If I had to rank my favorite cuisines, Indian would be in my top 3. There’s something so comforting about it. I love the smell of the spices, and the heat of the food combined with lighter components like coconut and cucumber just scratches me where I itch, to quote Kramer. 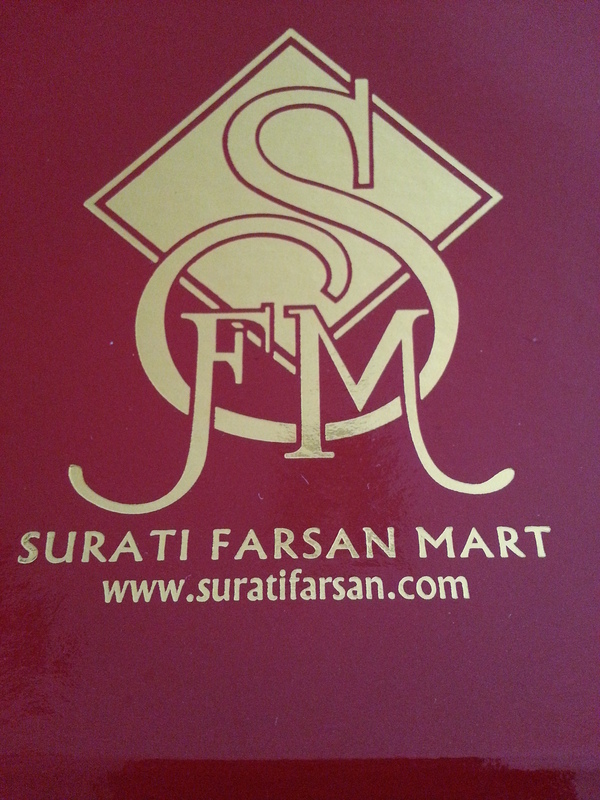 We decided to have lunch at Surati Farsan Mart which opened in 1986. I was overwhelmed when I looked at the menu. Take a look at their website and you will understand. My friend, Christin, advised that I order Dosa. I had never had one before, so I was excited to try something new. It’s a thin rice crepe that is somewhat crispy. 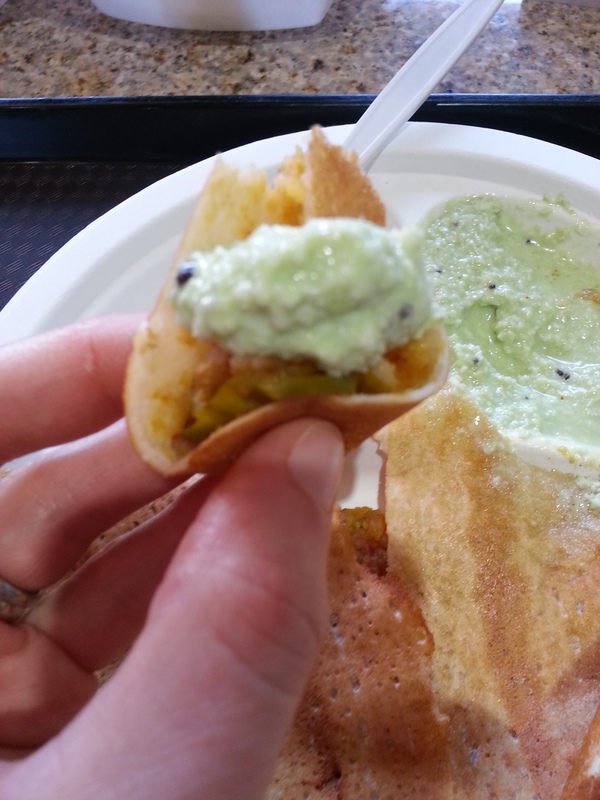 There are a few filling options, so I opted to copy Christin and I ordered the Mysore Masala Dosa. It is stuffed with vegetables that have a little kick that is tamed by the coconut chutney that is served under the Dosa. When you lift it up, you will find the chutney and your silverware. On the side, a delicious vegetable soup is served which can be poured over the crepe, but I opted to dip my Dosa into it. If you have any soup left over, take it with you and pour it over some rice for another great meal at home. We easily could have split one between us, but I didn’t realize just how filling one would be. 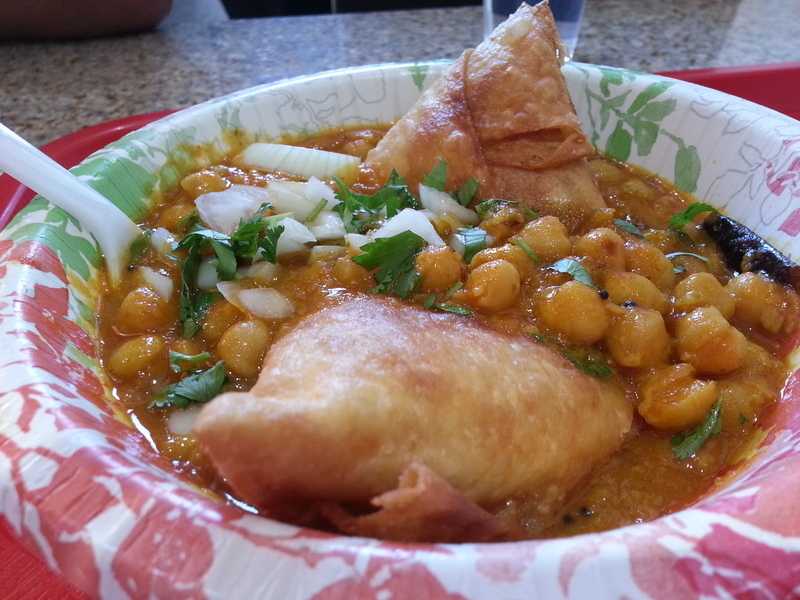 We ordered an appetizer, Chole Samosa, that was so full of flavor. If you haven’t had a Samosa before, just go here and order any one listed on the menu. You will love it! Just don’t be like Michael Scott from The Office and confuse Samosas with S’mores. The one we ordered was topped with a sauce containing chickpeas and onions. The flavors were so fresh and bold. If you want a meal that will wake up your mouth, this is it. Coconut Chutney – SOOOOO Good! I must say that I am so disappointed with myself. I feel like I’m an adventurous person food wise . I must note that in any other aspect, I am not adventurous. I did a zip line over Fremont Street in Las Vegas, and I thought I was Evel Knievel. Anyway, I’ve never ordered an Indian dessert. I never liked the look of them. Again, I’m so mad that I acted that way. 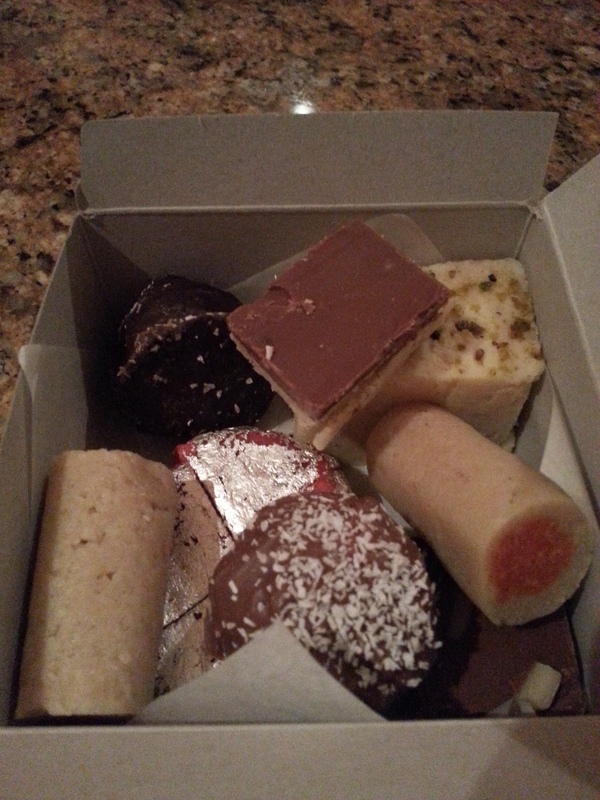 Christin ordered a few desserts to take home to her husband, so she let me taste a couple. My hesitation with Indian desserts was that they look super sweet, like baklava. (And I like baklava, it’s just not a favorite of mine.) 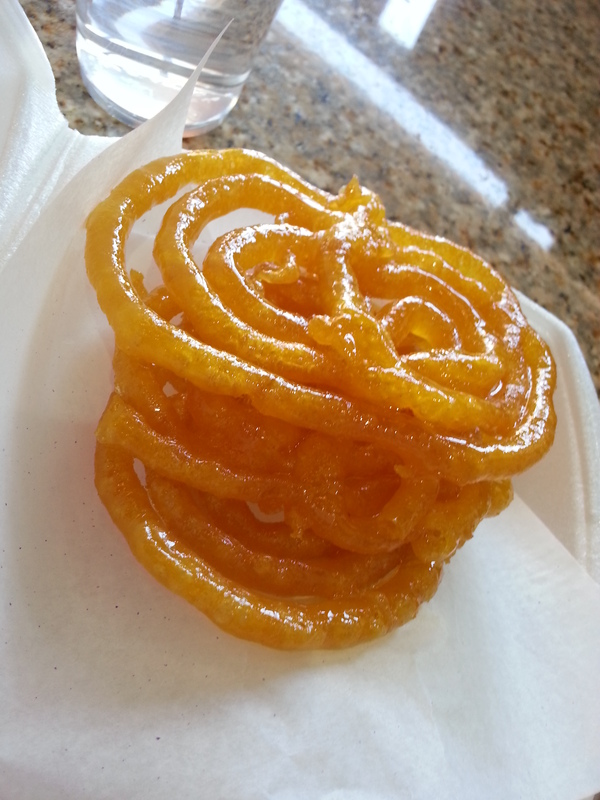 First, she had me try Jalebi. The orange color was what discouraged me from trying this item. It is coated in honey, which was another deterrent for me. Surprisingly, it wasn’t super sweet. It feels like you are holding fried air, if one could deep fry air. What a wonderful place that would be! The next dessert my friend introduced me to, which in the past I always passed right by because of the look of it, was Barfi. It had just a hint of sweet from the condensed milk and sugar. 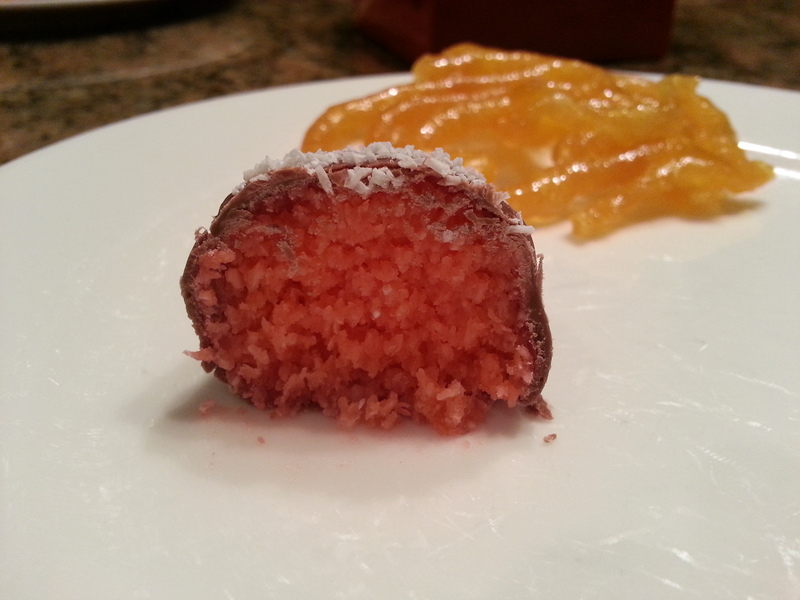 It had some crushed cardamom on top that gave the dessert some complexity. I loved it! 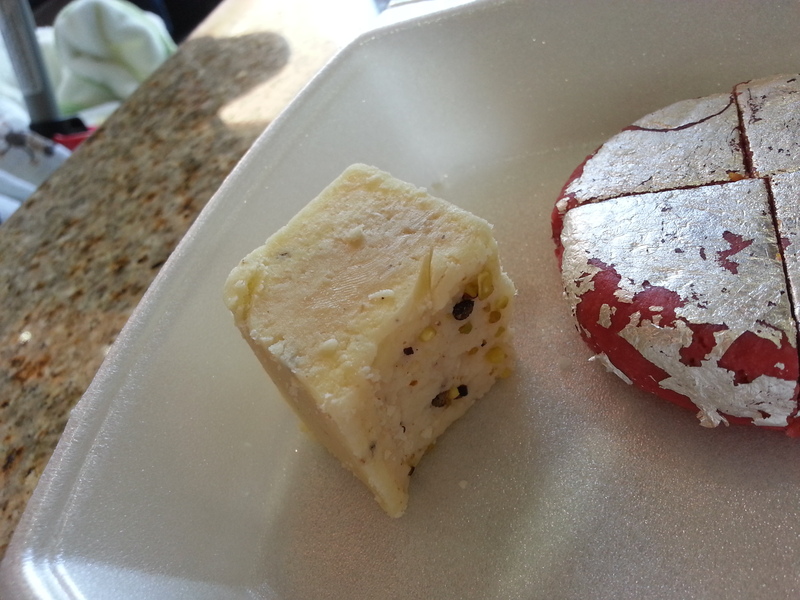 I bought a box of assorted desserts to share with my husband, and he thought Barfi tasted somewhat similar to cheesecake, possibly a Ricotta Cheesecake because it isn’t creamy at all. I could eat this all day long! The Chocolate Rose Coconut Roll was my favorite. I loved the color, and Franz loved that they tasted like one of his great loves: Strawberry Zinger. 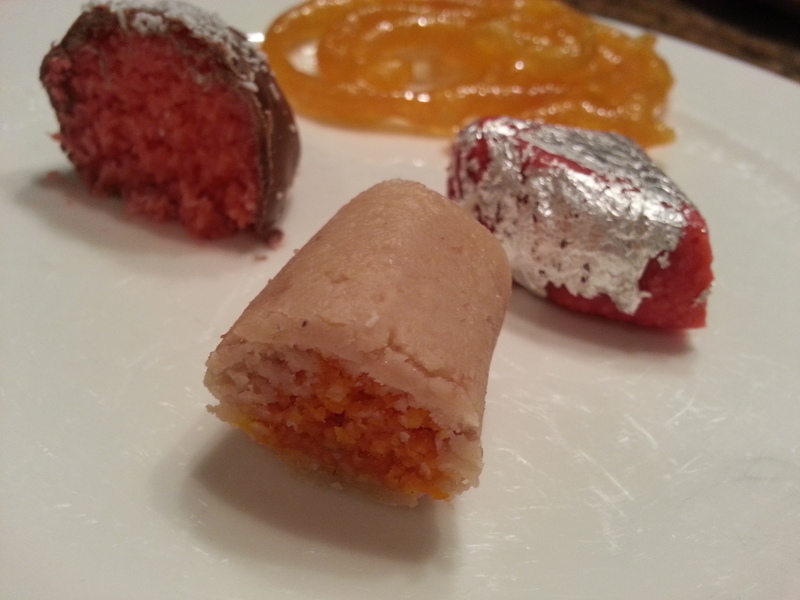 The only treat Franz and I did not enjoy was Kaju Badam Roll. Unfortunately, the appearance reminded us of a dog treat. But that wasn’t what we disliked; it was the flavor. It is a cashew roll with an almond filling, but for some reason it had a smoky flavor which reinforced the dog treat idea. It is just not for me. I was happy I tried it though! Chocolate Badam Barfi was just in the middle of the road for me. It was an almond square layered with chocolate and almond slivers. There was nothing wrong with it, I just preferred some of the other desserts more. 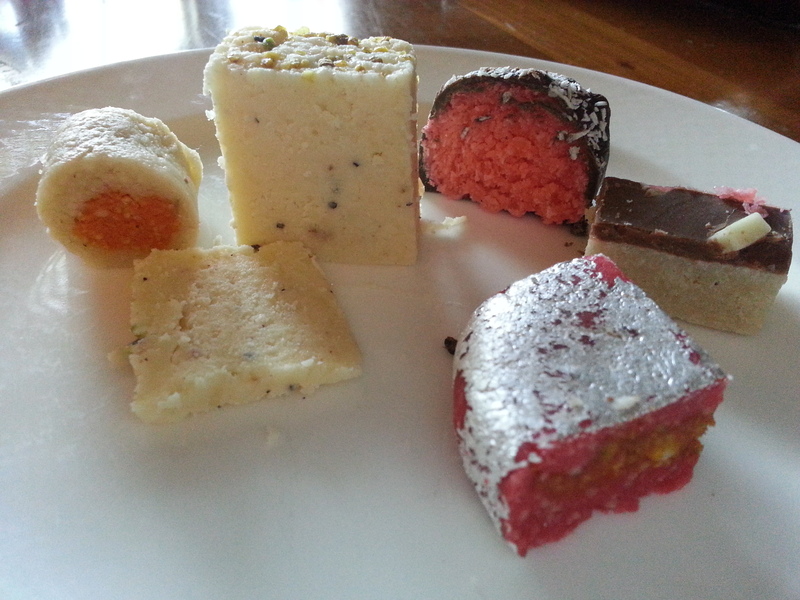 The most interesting dessert was Rose Kaju Anjir Barfi. It is similar to a cookie, and it is cut into quarters. You can opt to order just a quarter which would be one bite for most people. It has a fig, cashew and almond filling. Apparently nut allergies are not a problem in India. It is flavored with rose-water, and I am usually not a fan. 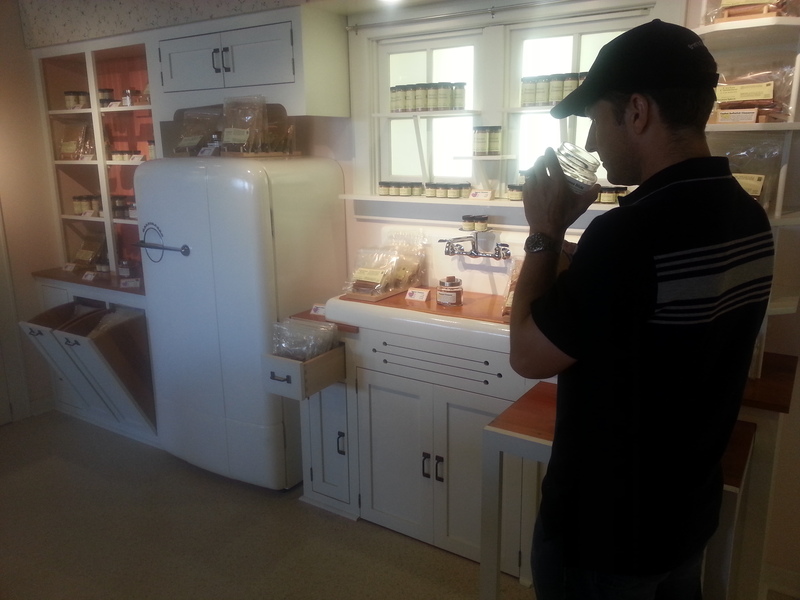 However, the rose-water was very subtle and it went really well with the other flavors. What I particularly enjoyed was the silver coating. It flaked away so that the bright red of the cookie shows through. I thought it was gorgeous, and I thought it was cool that it was safe to eat! If you go to the store’s website, you can order any of these desserts and have them shipped. Visiting Surati Farsan reminded me to be open-minded. Sadly, I thought I was! I love when something surprises me! If you are in the mood to cook an Indian meal at your house, and you are not close to a Little India where you can buy spices, another option is Penzeys Spices ( http://www.penzeys.com/). There’s one in my neighborhood of Hillcrest, but they are located throughout the country (http://www.penzeys.com/cgi-bin/penzeys/penzeysstores.html). The first one I visited was in Cleveland, Ohio near the West Side Market. 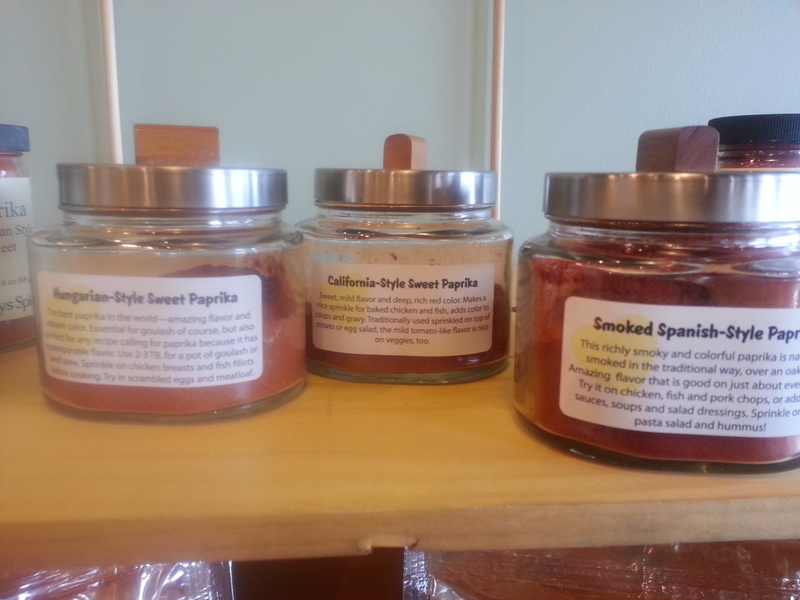 I love visiting this store because they have sample containers around the store so you can smell each herb and spice. See how long it takes before you sneeze. And if you prefer someone else creating a certain blend for you, they sell that as well. For example, they sell Old World Seasoning which could be compared to Lawry’s. Take a look at their online catalogue or, if you are lucky enough to have a store near you, stop in. The people who work there are always happy to help. I Love This Section of the Store! They have cute gift packages for special occasions, like a wedding or house-warming party. If you go, let me know what cool stuff you found! What a great find! I too am very nervous about Indian desserts. They never look very appetizing. But honestly, I’ve never even SEEN most of the items you tried. They look, and sound, much better than the rice pudding type things I typically see. I am officially hungry! I don’t think I’ve ever had one. I always went for chocolate when I was a kid – and I still do! I wonder if they still sell Strawberry Zingers? I will look for them! I love Indian food but have never had an Indian dessert. Next time I’m in an Indian restaurant, Ill try to restrain myself from eating so many appetizers so I’ll have room for something sweet. HA! That is the hardest part – saving room!